Posted by Bravado Cooking for Men in Classic French Dishes, Recipes. Sometimes we call something by a certain name for so long that we really forget what it is all about and the name bears no resemblance to the real thing. For example, I call my wife “sweetheart”. French toast is another good example. We have to peel away the layers of alteration and adulteration in order to find the true essence. This is what Bravado chefs do – we constantly seek truth and beauty (and a good Cabernet); we want to stop the silly meddling with the classics and get back to basics. 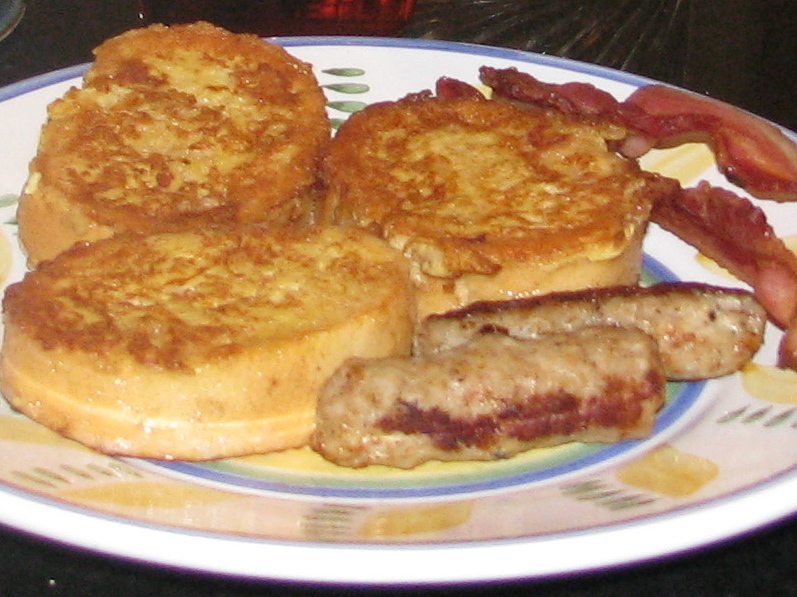 Americans have screwed up French toast so badly that it’s a wonder anyone eats it. Only by trying the real thing, as illustrated in the recipe below, will you understand what I’m talking about. At first bite, your eyes will pop and the word “magnifique” will blurt from your mouth as if by magic. Rather than just reading this post, try this classic French recipe out over the Fourth of July holiday – you will some free time in the morning and probably some people around for whom you can show off your skills and your knowledge of the history of the dish. The French typically buy a baguette of bread every single day – usually in the morning so they can have some for lunch and dinner. Bread and butter are always on a French table. Often there is bread left over, which starts to turn hard the following day. 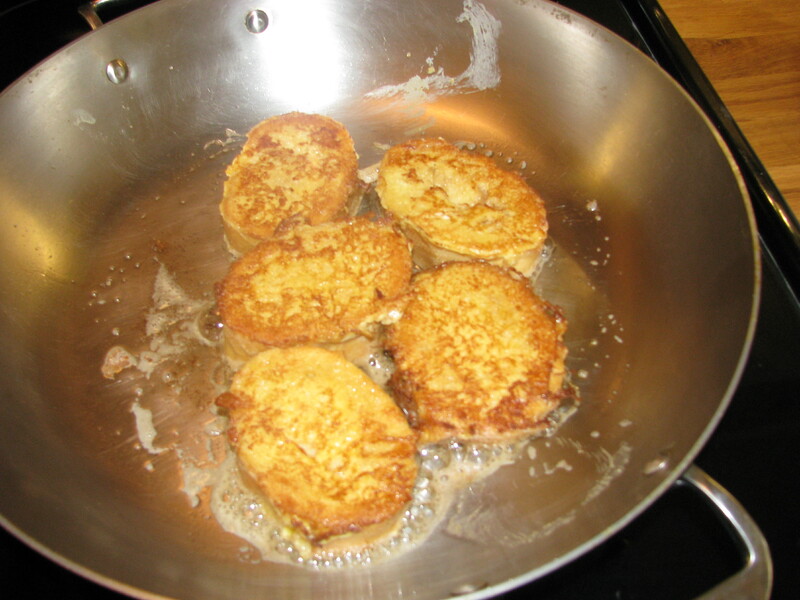 Rather than waste the bread, the French soak it in egg and milk and fry it in a skillet. 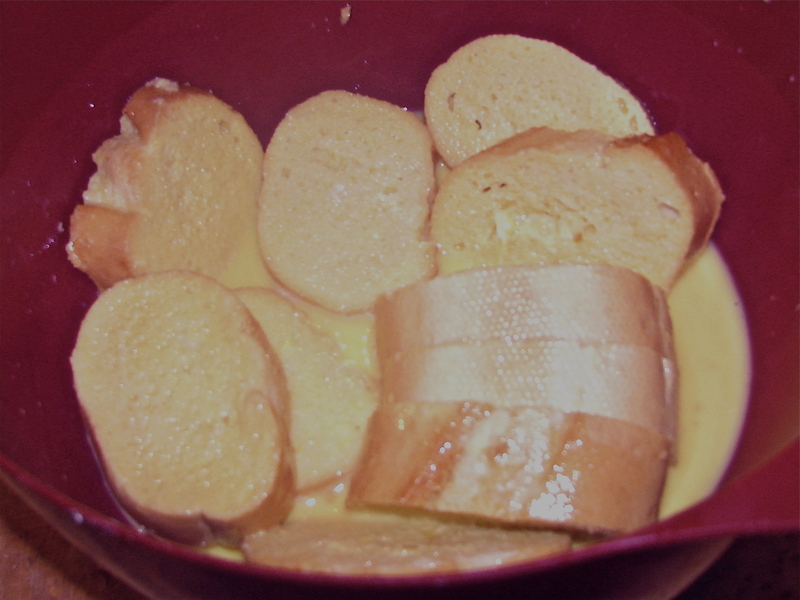 They call it “pain perdu” – literally translated “lost bread”. It’s been a common French breakfast for hundreds of years. French Bread: The reason that a French baguette lasts, or stays soft, for such a short time is that it contains only flour, water, and salt – there is no oil, shortening or butter, which are the things that help bread last longer. Interestingly, there is a law in France that requires baguettes to be made with only these simple ingredients. The day old baguette really soaks up the milk and egg and a hot pan with plenty of butter produces an amazing result – a nice crispy exterior and a soft moist interior. 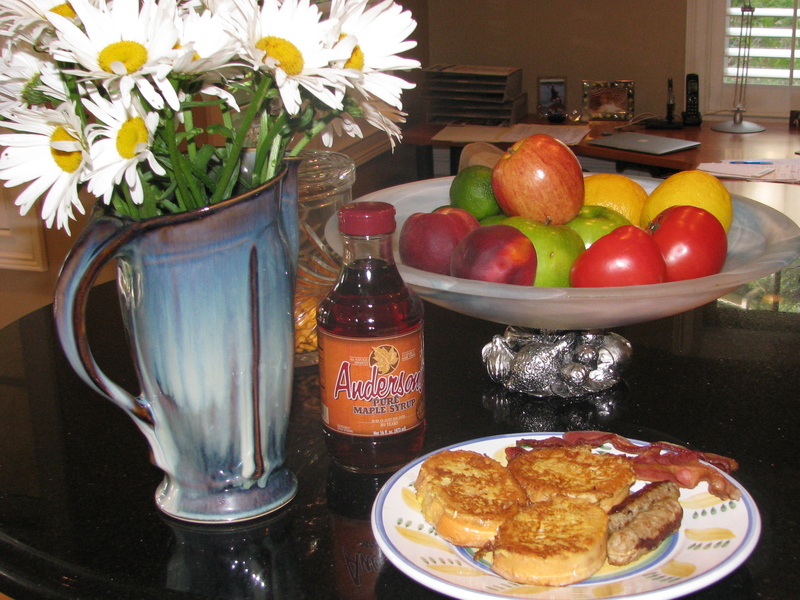 With some honey or maple syrup and possibly some blueberries, you have a wonderful start to the day. Don’t forget the sausage and bacon. The key to the recipe below is to use one-day old bread and let it soak for at least 15 minutes in the milk and egg mixture. Don’t try to shorten the soaking time – use those moments to make a Bloody Mary, gently rouse that special person or whatever – shine your shoes. Don’t use bread that is more that one day old – bread that is too old will not re-hydrate well. Whisk together the eggs and milk for about 30 seconds in mixing bowl. If you wish, you can add vanilla and/or cinnamon to the mix. Try it once and see what you think. Cut the baguette into slices that are about ¾ – 1 inch thick. In a lasagna or baking pan, lay out the slices of bread in a single layer and pour the egg/milk mixture over the top. Soak for 15-30 minutes, turning a few times, until all of the liquid is absorbed. Heat the butter in a large skillet over medium high heat and fry the bread in two batches – don’t crowd the pan and add more butter if needed. (Too much butter is, as we all know, an oxymoron). Serve with maple syrup and/or honey and maybe some bacon and sausage. As you are serving, tell everyone why you are making true French bread and why truth and beauty are so important to you. Slap anyone who laughs – this is real.